Should I File a Personal Injury Case or Claim? A huge concern of many injured people is feeling wrong about bringing a claim for injuries they sustain as the result of the negligence of another. Some of our clients come into the office and they feel uneasy about pursuing money for personal injury they sustain in an accident. Recovery of money for the negligence of another is a well settled right under our laws. Many times, in not pursuing your just compensation you are only helping insurance companies and hurting your family and yourself. First, you can pursue a claim for personal injury without filing suit or a legal action. Many personal cases are settled without a lawsuit of legal action with the insurance company or defendant settling before any case is filed. Unfortunately, because many insurance companies are unreasonable, cases do wind up in a lawsuit or litigation in order to force them to pay. 1. Whether someone else was at fault in some way. 2. 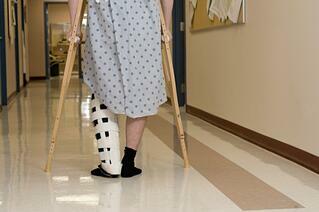 Whether you are seriously injured with a permanent or temporary injury. 3. Whether you have received treatment for the injury and the length and duration of that treatment. 4. Whether you have lost time from work or school. 5. Whether you have medical bills resulting from the injury. 6. Whether you are limited in your ability to perform your job or normal activities as the result of the injury in any way. If these factors do not weigh heavily, then perhaps you want to consider whether you want to do something about the injuries. On the other hand if these factors weigh heavily, then you most likely want to pursue a claim. Always remember that you are not doing anything wrong in pursuing a claim for personal injury. Our law allows for full recovery of a loss a person sustains in order to put them back to the same position - as much as money can do - to where they were before the accident or injury. You did not ask to be injured as the result of someone else's negligence. At a minimum, it cannot hurt to speak to a personal injury attorney in one of our New Jersey offices and go over the pros and cons of bringing a claim for your injuries. The consultation is free and confidential.